LONDON -- British police have confirmed they are holding the lone suspect in the van attack outside a London mosque on suspicion of committing terrorism offenses. 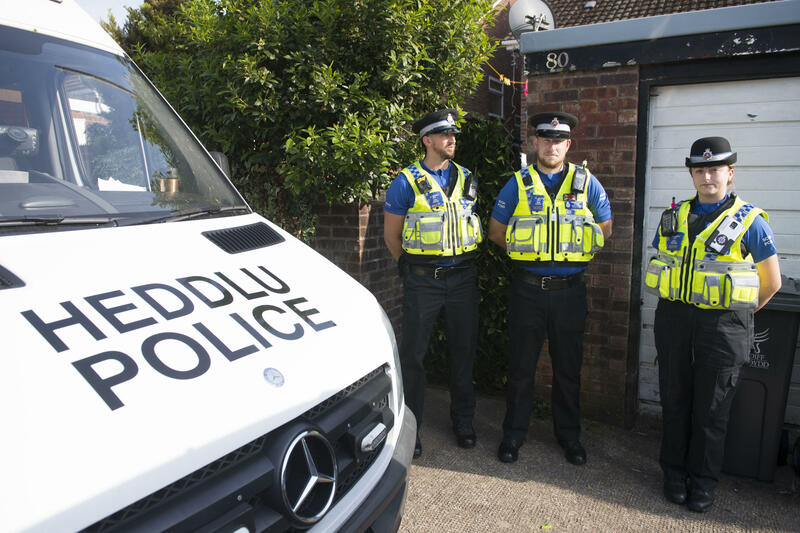 Police have not formally charged or publically identified the 47-year-old man, but he has been identified by family and neighbors as Darren Osborne, from the Welsh city of Cardiff. He was initially arrested in the early hours of Monday, after being held by bystanders to the attack, on suspicion of attempted murder, but the latest statement from the London Metropolitan Police made it clear he was also likely to be charged with terrorism. Some of Osborne's neighbors have described the father of four as "aggressive" and "strange" in interviews with British media, and a family member said he was a "troubled" man who had struggled with mental health issues recently, but insisted he was not a racist. Witnesses said Osborne claimed he wanted to "kill all Muslims" after he drove into a crowd leaving a mosque early Monday morning. One man who was receiving first aid at the time of the attack died; it was still unclear Tuesday if his death was a result of the attack or from a previous condition. Osborne is now being held on suspicion of the "commission, preparation or instigation of terrorism including murder and attempted murder." In a statement released on behalf of the family, the suspect's nephew Ellis Osborne said his uncle was "not a racist," and had never expressed racist views. He said the family was "massively shocked; it's unbelievable, it still hasn't really sunk in. "We are devastated for the families, our hearts go out to the people who have been injured," he said, adding, "It's madness. It is obviously sheer madness." Osborne's own mother, Christine, 72, told The Sun newspaper she was living "every mother's worst nightmare." She said she screamed when she him being arrested in video broadcast across Britain on Monday morning. "My son is no terrorist -- he's just a man with problems and I don't know how to cope with all this." She said Osborne had never spoken to her about Muslims or terrorism. Other acquaintances, however, have described Osborne as a man with a short temper, who may have separated from his long-time partner in recent months and. Osborne's own Muslim neighbour in Cardiff, Khadijh Sherazi, told The Guardian newspaper that he had never been any trouble, until the weekend right before the attack. Her 12-year-old son told her he was riding his bike when Osborne, "just came up to me and said, 'Inbred.' Just out there. It was just a normal voice." The boy's 10-year-old sister also reported hearing Osborne utter the word "inbred" while in his garden, seemingly addressing his neighbors over the fence. Possible hate crimes against Muslims probed across U.S. According to The Guardian article, Osborne had a Twitter account, which was following leaders of the far-right Britain First political party. Britain First declares in its official mission statement that it wants to "restore Christianity as the bedrock and foundation of our national life as it has been for the last one thousand years." The attack outside the mosque on Monday follows a rising wave of violence and harassment directed against Muslims across Britain and around the world. This month alone, a Muslim woman wearing a head scarf told police in Lancashire, England, that her car was struck by a bag of vomit. Worshippers at the Omar Faruque mosque in Cambridge found strips of ham attached to their vehicles. Several Muslim families have reported receiving letters warning, "You are no longer welcome in this country." Scores say they have been spat on. Across Britain, Muslims say they are being targeted by a wave of animosity and violence simply because of the way they dress and worship, and because they share a religion hijacked by bloodthirsty extremists like the Islamic State of Iraq and Syria (ISIS), which was quick to claim responsibility for recent attacks in Britain and elsewhere. The attack Osborne stands accused of saw the use of a tactic espoused by ISIS, and used by the group's own supporters in recent attacks on the Westminster and London bridges. Since the wave of ISIS-inspired terror attacks in Britain, there has been a five-fold increase of hate crimes against Muslims. Tensions have also been running high since Britain's decision to leave the European Union, a vote that was largely driven by anti-immigrant rhetoric -- a message that was further reinforced by some of Britain's right-leaning tabloids and spread by populist European politicians promising to stem immigration and tackle terrorism associated with ISIS. Attacks against Muslims have been on a worldwide increase. In January, a white nationalist opened fire on an Islamic cultural center in Quebec City, Canada, killing six people and wounding nearly 20. In the same month, the Islamic Center of Lake Travis in Austin, Texas, was destroyed by a fire in what authorities called a hate crime and another mosque was burned to the ground. Last year, nearly 100 mosques were attacked in Germany and dozens across Europe have been targeted by arsonists this year.